While you are outside hunting Pokemon or helping your children hunt Pokemon, consider adding another mobile app to your smartphone or tablet. The Federal Emergency Management Agency (FEMA) mobile app alerts you about severe weather and other natural disasters. The app is also a great information resource on surviving disasters and connects you to FEMA for immediate assistance. A feature you won’t find in many other apps is the ability for users to crowdsource photos of disaster areas to help first responders. 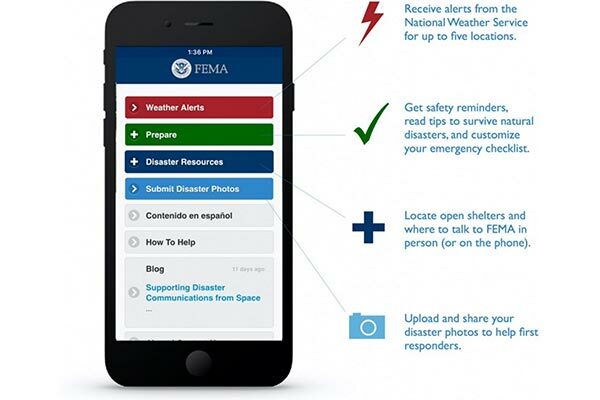 The FEMA mobile app is divided into four main sections: Weather Alerts, Prepare, Disaster Resources, and Submit Disaster Photos. What I especially like about the Weather Alerts section is the ability to receive alerts for up to five locations. I can receive alerts about the weather in Alexandria, VA (my workplace), College Park, MD (my home), and Louisville, KY (my rental home). In the Prepare section, I can create an emergency checklist and receive safety reminders. Thankfully, I have never needed to use the Disaster Resources section, but it is comforting to know where the nearest FEMA shelters are and how to contact FEMA personnel. Before discussing Submit Disaster Photos, I want to also point out the app’s ability to present the content in Spanish and its links to a blog on preparedness topics. Overall, the user experience is clean and intuitive with large buttons and large text. The simple menu system is an important design element as the app will be used in emergency situations and must be easy to read and navigate. Submit Disaster Photos is a unique feature that utilizes crowdsourcing to help FEMA better serve the public. By providing a photo-sharing platform, people in the disaster area can provide on-the-ground intelligence to aid first responders in managing a disaster. Photo sharing is an interesting feature that could be vital in disaster situations and is something I would like to see expanded. During disasters, electrical power and wireless communication often fails. Without functioning cell towers, there are no cellular networks or WiFi networks. So, how do people communicate? Through using “mesh networks.” A mesh network uses software on mobile devices to turn each mobile device into its cell tower. Every mobile device in a mesh network connects to other mobile devices through the WiFi radio and Bluetooth radio. More mobile devices joining the mesh network increases the range and power of the mesh network. There are a few apps that use mesh networking. Firechat and Jott are being used by mostly teenagers to create secure chat networks without having to use data plans or a WiFi network. In Australia, there is the Serval Project, which is free mesh networking software designed to build mesh networks during disasters. When FEMA updates the FEMA mobile app, I hope they consider building mesh networking functionality into the mobile app. The ability to maintain a wireless communication network when all other communication methods have failed will make the FEMA mobile app even more valuable to the American public. (The mention of Pokemon, Firechat, Jott, or the Serval Project is only used for illustrative purposes and does not imply the endorsement of the U.S. federal government or any specific federal agencies.) Each week, The Data Briefing showcases the latest federal data news and trends. Dr. William Brantley is the Training Administrator for the U.S. Patent and Trademark Office’s Global Intellectual Property Academy. You can find out more about his personal work in open data, analytics, and related topics at BillBrantley.com. All opinions are his own and do not reflect the opinions of the USPTO or GSA.